Ever wonder what would happen if Nazi Germany actually won WWII? If so, then Wolfenstein: The New Order is exactly what you’re looking for. Wolfenstein puts players in an alternate universe where not only did the Nazi’s win WWII, but they completely dominate the world. As a continuation of the last Wolfenstein game from 2009, you will play as William “B.J.” Blazkowicz. The game takes place 14 years after during the 1960’s. Players will have a challenging time attempting to defeat the brutal and unrelenting force of the Nazi army. After losing the last offensive against the Nazi’s during WWII, Blazkowicz is rendered unconscious from an explosion, waking up 14 years later in a mental asylum in Poland. After watching the entire asylum patients and staff get executed, Blazkowicz wakes from his coma and the Nazi killing begins. Nazis aren’t the only enemies you’ll be fighting; you will have to fight their terrifying creations as well. Giant robot dogs, robots wielding chain guns, and stronger classes of soldiers such as armored shotgun and rocket soldiers will do anything to kill you. 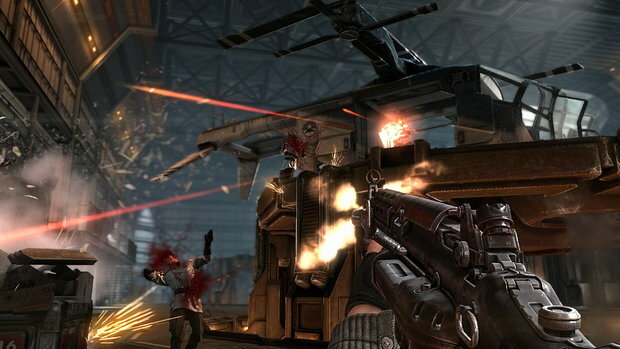 Wolfenstein offers two different types of gameplay: a stealthy approach or all-out war with guns blazing. The game incorporates a perk system where players are able to obtain certain upgrades depending on which play style they prefer. There are 4 different categories of upgrades to earn: stealth, ammo, duel wielding, and grenade upgrades. The unique part of this skill tree is how to unlock the perks. Most games with skill trees require you to level up and use skill points to unlock upgrades. 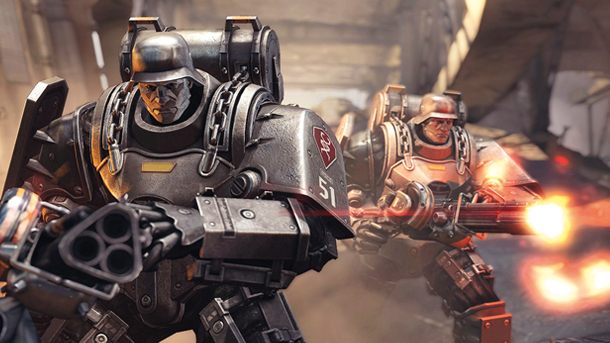 In Wolfenstein, players will have to complete certain challenges in order to unlock the perk. If someone was dedicated enough, they could completely fill up all four skill trees. 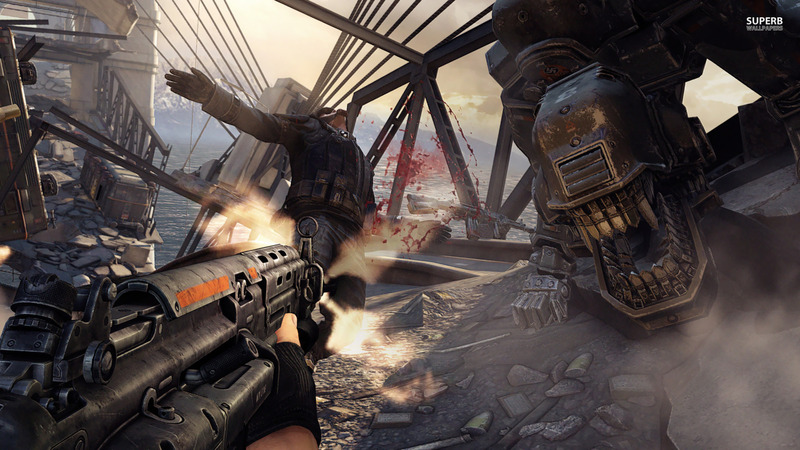 Though the game is a first-person shooter, Wolfenstein adds an entertaining and gruesome concept to the game play- duel wielding. Nothing is more rewarding than mowing down a squad of Nazi’s with an assault rifle in each hand. You are able to duel wield pretty much every weapon in the game, besides the laser cutter gun. Pistols, assault rifles, shotguns, knives, even snipers are available for duel wielding if you feel like it. The duel wielding is fun, but most of the time there are either not enough enemies fighting you, or there are too many enemies scattered around the area shooting at you, so instead you would need to take cover rather than running around with two guns in your hand. There is limited customization with what weapons you can duel wield. You are only allowed to duel wield two of the same weapon. Why can’t I have an assault rifle in one hand and a shotgun in another? The game would then be TOO badass I suppose. Where Wolfenstein truly shines is the story. There are many memorable and unique allies and villains you encounter throughout the game. MachineGames and Bethesda were not afraid to exclude multiplayer in Wolfenstein, and personally, I don’t have a problem with that. By excluding the multiplayer, the creators were able to focus solely on the single player, delivering a deep and engaging story that would even warrant a second play through. The creators of the game did a very good job creating this alternate Nazi dominated universe. Knowing how brutal the Nazi’s were in real life, the game looks and feels like what would actually happen if the Nazi’s won WWII. Wolfenstein: The New Order is a game that would make a fine addition to a next generation console collection as well as a good game for the last generation too. Though the lack of multiplayer hurts the replay value for most players, Wolfenstein makes up for it with fun gameplay and a great plot, not to mention the game looks beautiful. First-person shooters have a habit of being very similar gameplay and story-wise, but Wolfenstein gives players a fresh new experience on the shooter genre.